After 10 days, P's finally back in town. And because I'm leaving for the student community service in 3 days (and probably not seeing him again for the whole 40 days), we decided to make the most of today. We watched The Legend of Korra season finale (because we're big fans of the show!) and had lunch in Madtari. After that, we went to Superindo Dago to play Pump It Up. He was excited since he didn't find the newest version of Pump It Up machine in his hometown. He really loves that game that he could spend hours just to play it. He's already on level 11 while I'm stuck on level 7-8. Ha! After playing five game credits, we went to BIP to buy some stuffs. It was already dinner time when we went out of BIP, so we decided to have dinner rightaway. We shared a bowl of Takoyaki and Mango Dessert in Kedai Ling-Ling. 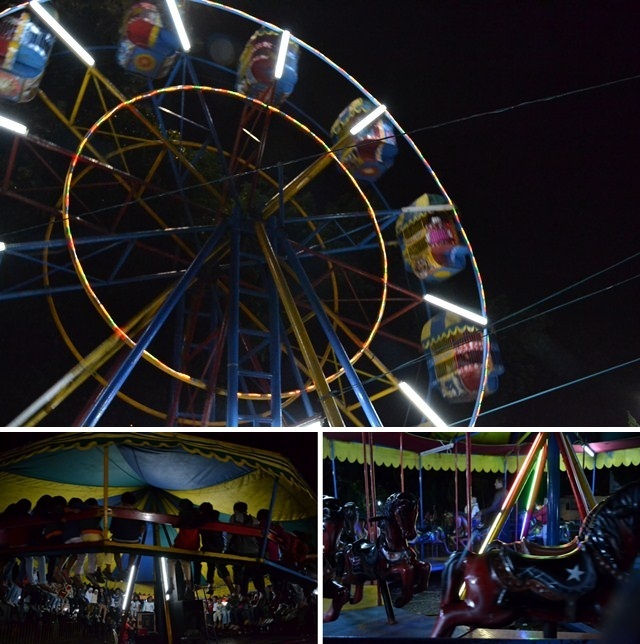 We left Kedai Ling-Ling at 7PM and headed to a carnival in KPAD Gegerkalong. We didn't buy anything nor get on any ride. P did ask me to get on a ride (the one which is like a merry-go-round but instead of only going in a cirle, it goes up and down to), but I refused because I never want to get on a ride which can cause me to get sick. I never have the guts to try such rides. Yeah, I know... I'm a chicken. Haha!